Four ambulances attended as 19 people were injured in a three kombis pile up near Bulawayo Entumbane Shopping Complex yesterday. JOHANE MARANGE APOSTOLIC sect members forcibly remove the seriously wounded kombi driver from hospital. He drove the kombi involved in the accident that claimed 13 lives in Macheke. 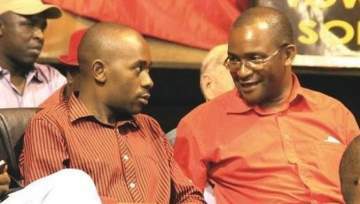 In a latest development, Mwonzora has written to all Provincial Chairpersons instructing them to disregard statements by MDC Spokesperson Jacob Mapfume who said the party’s elective congress has been postponed from March to between October and December next year. Said Mwonzora, “I refer you to the matter in today’s Daily News under the Headline Dirty money ravages MDC. The article suggests that our elective congress which was scheduled for February 2019 has been moved to a later date in 2019. “Please be advised that all communication regarding the holding of congress is the prerogative of the Secretary General s office and you must advise all our members in your jurisdiction to disregard any other communication being peddled as false and malicious. newzimbabwevision on CIVIL DISOBEDIENCE, PEACEFULLY SHUT DOWN ZIMBABWE and make it an ungovernable nation for President Emmerson Mnangagwa (76).